Have you ever bothered to constantly open and close or keep the door open for your cat? Dogs trying to use this door, but cats are against! If, someday, be a war between cats and dogs, then, in our opinion, this will cause the door! 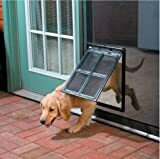 And all because the dogs are also trying to use this door, it is simple to install and incredibly easy to use! But we made it to make life better and funnier specifically for cats! This is the Simplest Door ever made! You also can purchase wall liner, if you want to install the “Comfy” Door to exterior or long doors. This is so simple, so cat will have access to litter box with no your involvement. 1 year Time Full Guarantee. You will have a replacement for door if it will come broken or not property package. Click the Button at the Top of this Page to Make Easier life of You and Your Cat Now! Cat Set is a registered trademark. ONLY Authorized seller of Cat Set can sell under Cat Set listings.